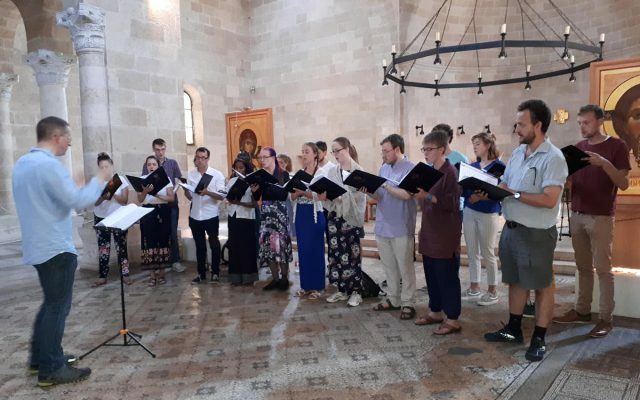 It’s hard to know how to begin describing Girton College Choir’s tour of the Holy Land. What had originally been envisaged as a series of concerts combined with sightseeing in a location soaked in historical interest and visual beauty became a rich and multi-layered journey with various strands that began to intersect in profound ways. Having settled on Israel as the destination, I asked McCabe to advise re local accommodation and internal travel. Not only did they book these for us, but they organised an itinerary which would take us from Nazareth to Lake Galilee, from the Jordan to the Dead Sea, and from Bethlehem to Jerusalem with numerous other locations on the way. Perhaps most significantly, they arranged for us to meet local Palestinian people and hear their stories as we visited the Separation Wall, Aida Refugee Camp, Al-Shurooq School for the Blind, Bethlehem Rehabilitation Centre and Jeel al Amal orphanage in Bethany. This added a powerful element to our agenda, which is almost certainly what resonated most strongly with many of the group. The programme had been designed around a Mass and settings of texts which pertained to the founding of the Christian church, mostly by Palestrina. However, our first piece was Ingegneri’s setting of Psalm 137, which climaxes with the words, “How shall we sing the Lord’s song in a strange land?”; as we saw the reach of the Separation Wall from a hospital roof, as well as the checkpoints Palestinian doctors have to negotiate five times a day, these words took on a more pointed meaning. And as Dr Abdelfattah Abusrour at Aida Refugee Camp concluded his absorbing lecture with the haunting statement, “I acknowledge the centuries of suffering inflicted upon the Jews, but Palestinians cannot take away the sins of the world”, how could we not think of the Agnus Dei (“Lamb of God, who takest away the sins of the world, have mercy on us”)? The Separation Wall is peppered with graffiti, and we were struck by a particular phrase, “Captivating Palestina” which, of course, led to our placing an “R” in the middle; but one recurring image is that which symbolises the “key of return”; when Palestinians were forced to leave their homes in 1948 they kept the keys to their houses in hope of returning there. Palestrina’s “Thou Art Peter” climaxes with the phrase “And I will give you the keys to the kingdom of heaven.” To sing these words, set to triumphant music, while surrounded by such painful imagery created a confusing paradox indeed. The reaction of locals to our concerts, however, was overwhelming, and it was telling that the Rowwad Centre at Aida focuses upon Art, Music, Dance, and Drama; what is held to be a luxury in this country is considered to be a lifeline and a beacon of hope to people who are not free. I hope that our singing the Lord’s song in a strange land helped them feel a little more free, if only for a moment.